When you visit someone's home, one of the first place you will usually be welcomed is the living room. 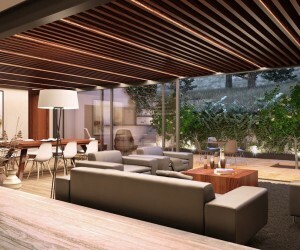 The modern day equivalent of a drawing room, these spaces are set up for conversation, connection, and entertainment. Each living room in this post creates a welcoming atmosphere with plenty of comfortable seating, vibrant colors, and elegant, modern style. They are the type of place you would be glad to show off and just as glad to be welcomed into. Have a look. 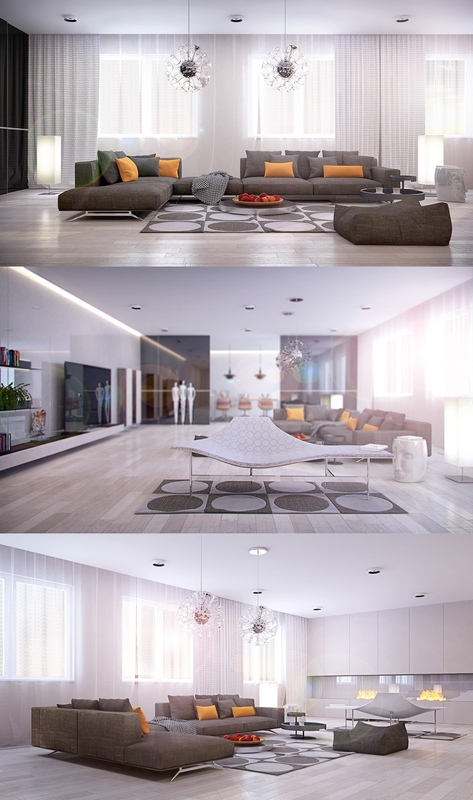 The pitched roof in this stylish home from visualizer Vizuall gives the living room a bit of height. Coupled with the low, angular sofa and modern sling chairs, the contrast creates visual interest while serving its practical purpose. Speaking of creative roofs and ceilings, the exposed brick ceiling in this living room from the same visualizer is so stunning that it’s easy to get lost in it. 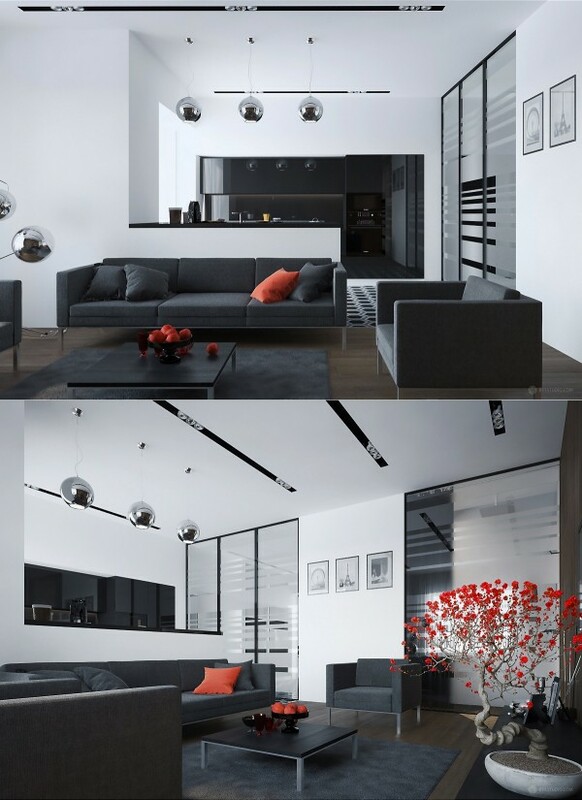 It stands again in contrast to the simplicity and clean lines of the neutral colored furnishings. 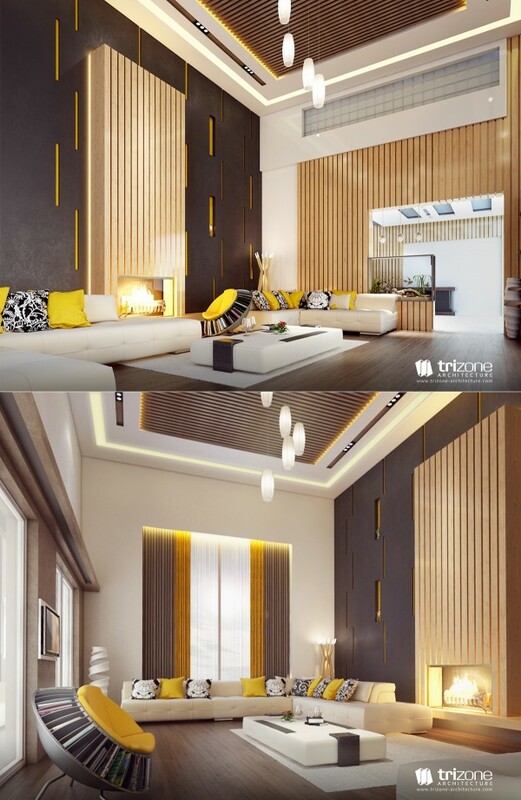 In this bright and modern living room, we also get a view of a spacious dining area and sunny kitchen. 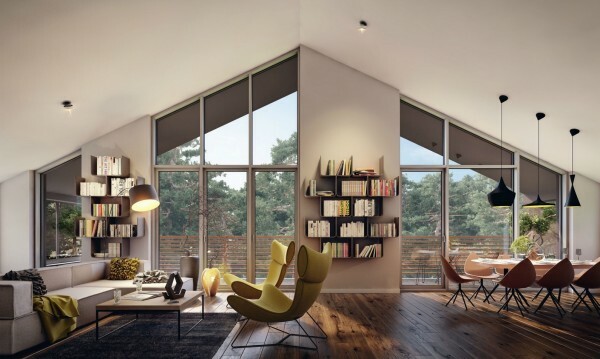 The open floorplan ensures that the home is welcoming from any angle. 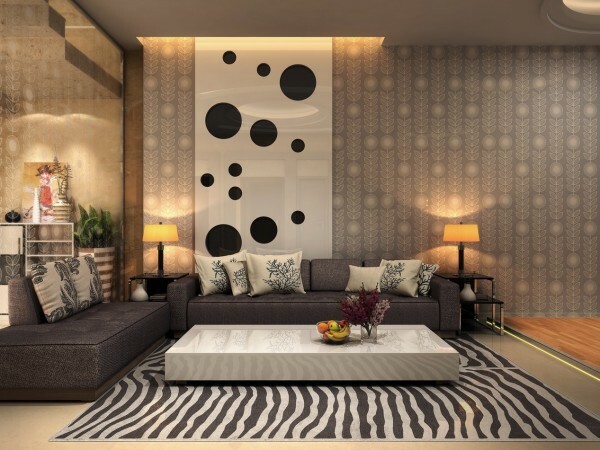 The patterns in this lovely living room from visualizer Gaurav are a bit whimsical and distinctly feminine. From the delicate wallpaper to the bold zebra print rug, each piece plays together for a cozy bohemian feel. This next living room is also from Gaurav but uses various soothing shades of blue to make visitors feel like they are drifting across a cool blue ocean. 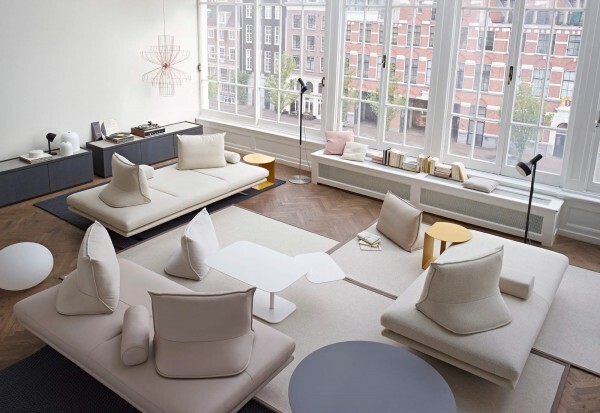 For a creative answer to the standard sofa, this urban living room uses upholstered platforms and movable pillows that allow whoever is sitting to create their own comfortable posture on the platforms or the floor. 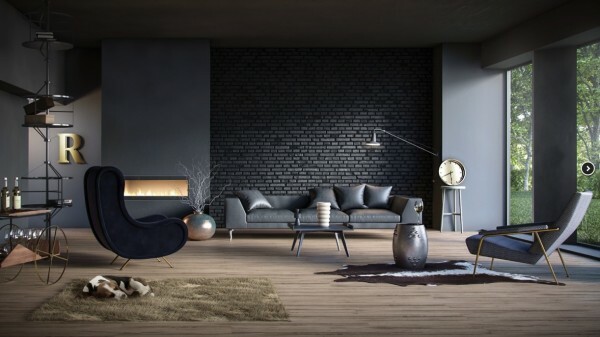 Because dark colors can make a room feel more closed in than welcoming, they only work in a living room like this that has plenty of natural light. The contrast in the wood flooring helps, too. The long swing arm wall lamp adds interest to the vertical space. 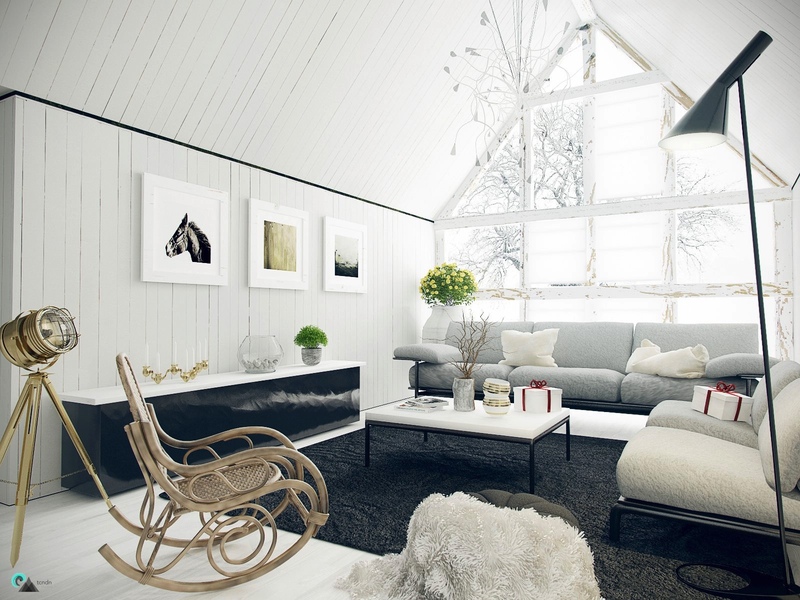 On the other end of the spectrum we have this light wood and white living room. It’s on the small side but plenty big for a cozy night at home. 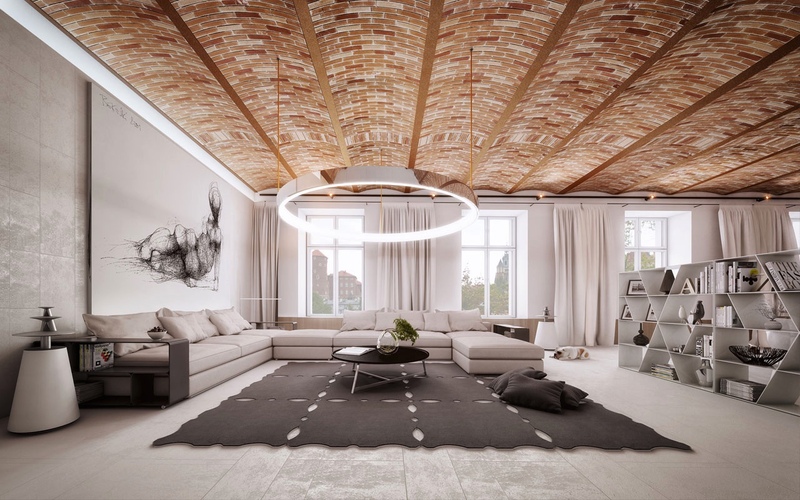 It can be tricky to decorate a living room with vaulted ceilings like these. The trick is to not try to compete. 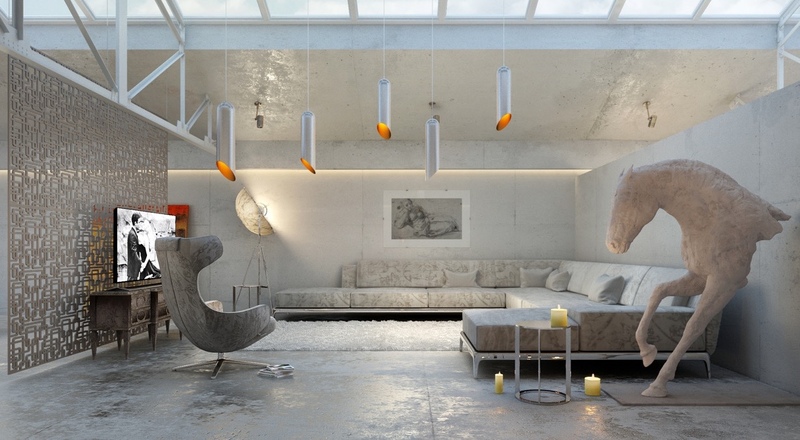 A long and low sofa in a nice neutral tone lets you marvel at the structure comfortably. Splashes of yellow add a sunny touch. In another smallish living room, we have just enough seating for a small gathering. 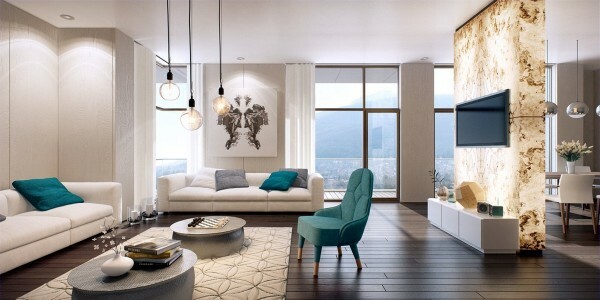 The dark wood frames on the furniture is a particularly sophisticated touch. The lighting in this living room gives it a mysterious air, like you could sink into the corner of one of a gray upholstered sofas and observe an affair unfold right in front of you. This large, open living room calls attention to the large windows, which feature gauzy white curtains that will keep out the harshest sun and heavier window treatments you can pull closed for even more privacy, or a sunset movie screening. You can’t comment on this living room without pointing to the half horse sculpture. No one could entire this living room without commenting on it, either. It’s half a horse. What else is there to say. 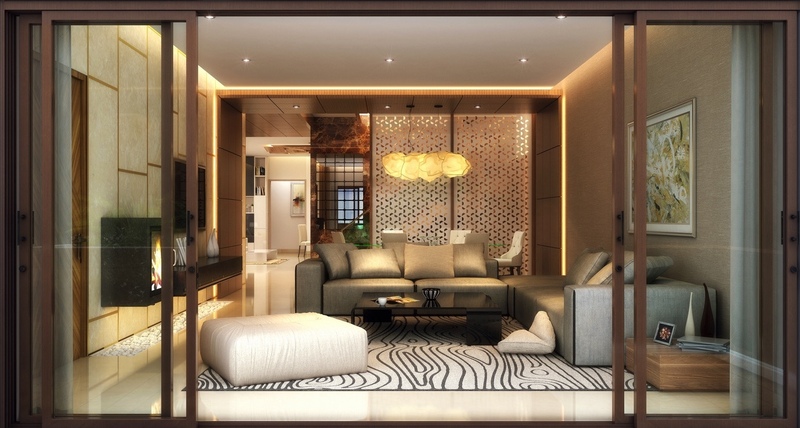 The sofas in this cozy living room are extra deep, making them ideal for a long afternoon nap. Try not to dream about any half horses. 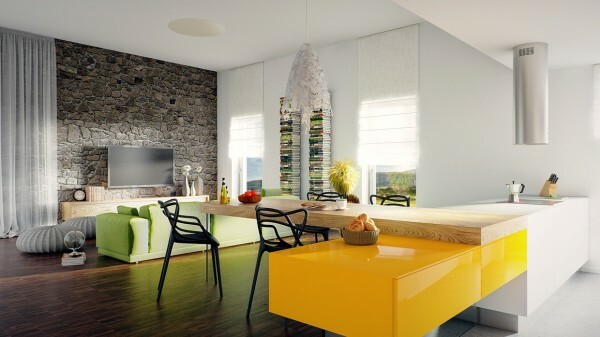 A citrusy color scheme gives this living room and kitchen a youthful buoyancy. 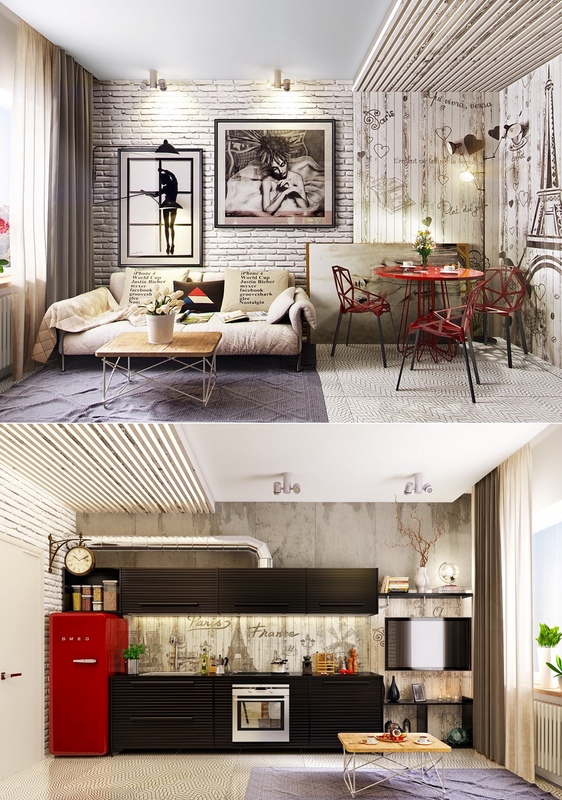 With a simple gray sofa and a couple of Eames-style rocking chairs, this apartment living room is an easy example of mid-century influence on contemporary design. 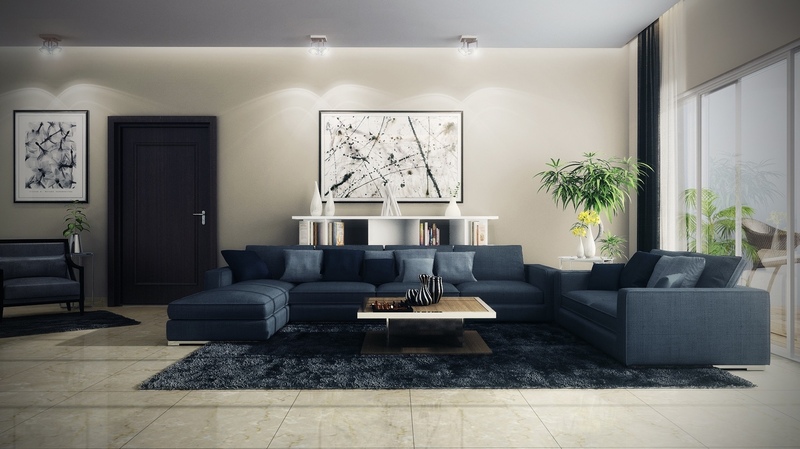 Keeping major furniture in neutral colors like light, airy gray makes it easy to swap out throw pillows for an instant change. 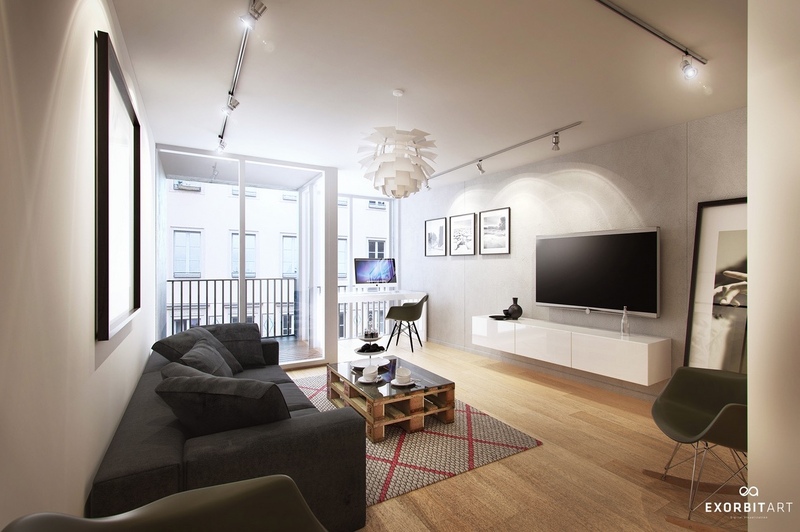 In a small apartment, a sofa might serve many purposes. This modern futon design can be a guest bed, a nap room, a sitting area, and a place for the dog. Sometimes it might have to be everything all at once. If you ever wondered what Santa’s house would look like if he shopped at Pottery Barn, you have your answer in this Scandinavian-inspired living room. And judging by the AJ floor lamp, you would have to say this Santa is pretty design conscious too! Less a living room and more an experience, this massive home with books to the tall ceiling is the kind of place that impresses. 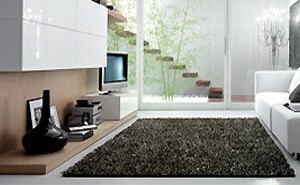 With inspiration from Japanese design, this cool, easy living room could entertain a CEO as soon as a toddler.